Much of the discussion over economic growth following the 2012 Kansas tax reforms were enacted is misguided, hobbled by a misunderstanding of what the tax cuts were trying to accomplish and reliance on incomplete data. Additionally, it fails to take into account the fact that most job growth in Kansas has been – and will continue to be – from pass-through businesses (i.e., sole proprietorships, S-corporations, limited liability corporations, and joint partnerships). In fact, the 36,135 jobs created by pass-through entities in Kansas represent 82 percent of all private sector jobs created in 2013 and 2014, the latest data available from the U.S. Census Bureau, and the growth is more than three times as great after tax reform than before. Using this Census data and other appropriate private sector data our analysis indicates that the impact of the tax reforms has been positive. Kansas comes out on top or at least shows strong growth in almost every relevant state comparison of the most comprehensive private sector job growth metrics. Kansas also matches up with other states well even when the less-comprehensive data often used to make comparisons is adjusted for the size of the state. It is also important to consider the source of job creation data, the structure of a state’s economic make-up, and a state’s population when comparing job numbers. In short, just as it would not be appropriate to compare student achievement for the Kansas City and Blue Valley school districts for obvious demographic differences, it is not appropriate to compare certain states just because of geographic proximity. The monthly employment numbers from the Bureau of Labor Statistics (BLS) use a different methodology to count employment than does a more comprehensive, but less frequent, analysis from the Bureau of Economic Analysis (BEA). For instance, the BLS data estimates that in 2015, Kansas had an employed private-sector workforce of nearly 1.4 million, while the BEA data puts it at 1.9 million. So while the BLS data warrants monthly media coverage this paper puts more emphasis on the BEA analysis as it better captures those employed by proprietorships and in farm employment. This study also uses new data from the Kansas Department of Revenue (KDOR) to clearly demonstrate that tax evasion or strategic corporate tax planning has not been widespread. KDOR records also make clear that the total value of the Kansas tax reforms from 2012 was primarily driven by lowering the income tax burden on individual wage earners. This is yet another overlooked aspect of the tax cut, as 71 percent of the overall tax relief went to individual taxpayers and 29 percent went to pass-through businesses through the income tax exemption. A final data point from KDOR also makes clear who is benefitting from the pass-through exemption. Median family income in Kansas is around $52,000 and 88 percent of the filers in 2014 with business income had Kansas adjusted gross income that year of less than $50,000. 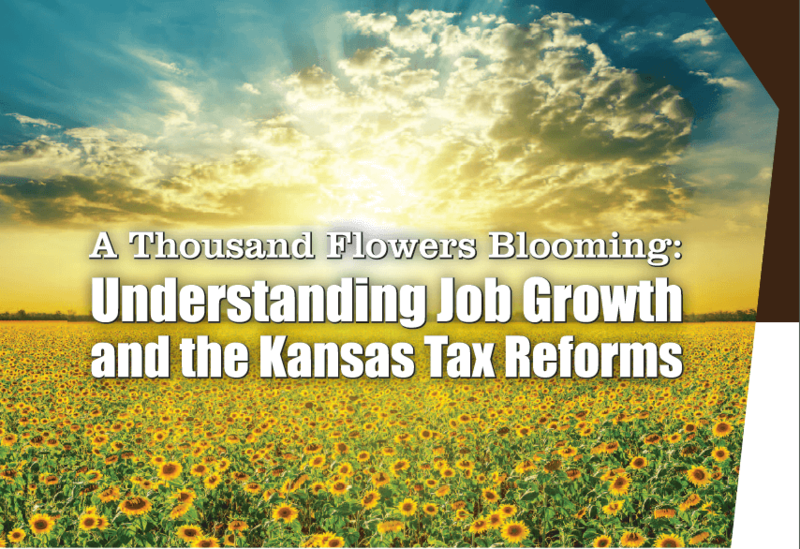 While there is still more analysis to be done and more data to be released over the coming years, we believe the preliminary signs indicate that the Kansas tax reforms have had and, more importantly, will continue to have a positive impact on state job growth.